Once your completed application has been received, your name will be published in the next edition of our bi-monthly newsletter, The Happy Howler. Current members will have a chance to comment on your application, and your membership will be voted on at the next monthly meeting following publication of your name in the newsletter, provided you have completed all other requirements. 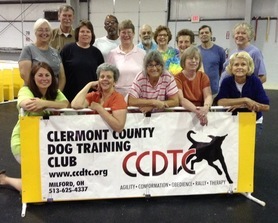 CCDTC's membership year runs Oct. 1 through September 30th. Dues are calculated from the date a new member is voted into membership. Members pay yearly dues and are expected to volunteer to help the club in some way. Membership carries a service requirement of 16 hours per year of service to the club for individual and 22 hours per family membership. There are many ways in which you can volunteer in the club. page to see where volunteers are needed.